Dr. K. Ravindranath - Chairman and Managing Director Global Hospitals Group inaugurated Global Specialty Clinics at Uppal Healthcare Center, IDA, Uppal in the presence of Mr. M. M. Reddy, Chairman, Uppal Industrial Employees Healthcare centre. Dr. Vijay Vemuri, COO - Global Hospitals, L.B. Nagar, Mr. S. V. Sudheer, Secretary IDA Uppal, Mr. Ashok Kumar, Senior Vice President and Dr. Gopinath, Chief Physician, UHC centre. Super specialists in 8 different specialties from Global Hospitals, L.B. nagar will be available for consultations for all the Industrial Employees, their families and neighborhood giving high quality healthcare facility for the people in the region. Global Hospitals, L.B. 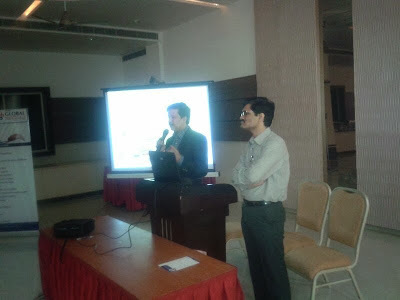 Nagar conducted a CME on 16th November'13. Dr. Srirang Abkari, Consultant - Internal Medicine & Dr. Pramod, spoke about Newer treatment modalities in Diabetes mellitus & Dr. Pramod Kumar, Consultant - Interventional Cardiology gave presentation on Cardiovascular disease in diabetes. Mr. Ashok Kumar, Vice President-Business development, spoke about the developments and further expansion plans of Global Hospitals Group. The CME was well attended by 130 doctors from the neighbourhood areas like Dilsukhnagar, Vanastalipuram, Santosh nagar, etc. Renowned doctors from ESI Dr Kataria &amp; Dr. Immanuelu were present. Dr. Mohan Rao from BDL was also present. Global Hospitals, LB Nagar launched Diabetes Clinic on the World Diabetes Day on 14th November 2013 - which is managed by a comprehensive team of specialists to provide a 360 degree treatment approach for people suffering from diabetes. The Diabetic Clinic was inaugurated by Lion Jithendra Kumar Garlapati, former District Governor of Lions Club. Event was organised in presence of Dr. Vijay Kumar Vemuri - COO, Dr. Pradeep Panigrahi - Medical Director, Mr. Ashok Kumar - Vice President Business development. Eminent consultant Dr. Dharam Rakshak along with Internal Medicine Team led by Dr. Srirang Abkari were present.